The inhalants are a class of drugs that include a broad range of chemicals found in hundreds of different products, many of which are readily available to the general population. These chemicals include volatile solvents (liquids that vaporize at room temperature) and aerosols (sprays that contain solvents and propellants). Examples include glue, gasoline, paint thinner, hair spray, lighter fluid, spray paint, nail polish remover, correction fluid, rubber cement, felt-tip marker fluids, vegetable sprays, and certain cleaners. The inhalants share a common route of administration— that is, they are all drawn into the body by breathing. They are usually taken either by breathing in the vapors directly from a container (known as "sniffing"); by inhaling fumes from substances placed in a bag (known as "bagging"); or by inhaling the substance from a cloth soaked in it (known as "huffing"). Inhalants take effect very quickly because they get into the bloodstream rapidly via the lungs. The "high" from inhalants is usually brief, so that users often take inhalants repeatedly over several hours. This pattern of use can be dangerous, leading to unconsciousness or even death. The latest revision of the manual that is used by mental health professionals to diagnose mental disorders is the Diagnostic and Statistical Manual of Mental Disorders published in 2000 (also known as DSM-IVTR ). It lists inhalant dependence and inhalant abuse as substance use disorders. In addition, the inhalantinduced disorder of inhalant intoxication is listed in the substance-related disorders section as well. Inhalant withdrawal is not listed in the DSM-IV-TR because it is not clear that there is a "clinically significant" withdrawal syndrome. In addition, withdrawal is not included as a symptom of inhalant dependence, whereas withdrawal is a symptom of dependence for all other substances. Withdrawal symptoms are symptoms that occur when a person who is dependent on a substance stops using the substance. Anesthetic gases (such as nitrous oxide, chloroform, or ether) and nitrites (including amyl or butyl nitrite) are not included under inhalant-related disorders in the DSM-IV-TR because they have slightly different intoxication syndromes. Problems with the use of these substances are to be diagnosed under "Other Substance-Related Disorders." There is, however, a significant degree of overlap between the symptoms of disorders related to inhalants and these "other" substances. Inhalant dependence, or addiction , is essentially a syndrome in which a person continues to use inhalants in spite of significant problems caused by or made worse by the use of these substances. People who use inhalants heavily may develop tolerance to the drug, which indicates that they are physically dependent on it. Tolerance is the reduced response to a drug that develops with repeated use. When a person uses enough of an inhalant, they will get "high" from it. The symptoms of intoxication differ slightly depending on the type of inhalant, the amount used, and other factors. There is, however, a predictable set of symptoms of inhalant intoxication. When too much of the substance is taken, an individual can overdose. Intoxication from inhalants occurs rapidly (usually within five minutes) and lasts for a short period of time (from five to 30 minutes). Inhalants typically have a depressant effect on the central nervous system, similar to the effects of alcohol; and produce feelings of euphoria (feeling good), excitement, dizziness, and slurred speech. In addition, persons intoxicated by inhalants may feel as if they are floating, or feel a sense of increased power. Severe intoxication from inhalants can cause coma or even death. 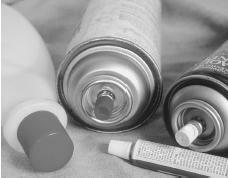 Because inhalants are readily available and inexpensive, they are often used by children (ages six to 16) and the poor. Factors that are associated with inhalant use include poverty; a history of childhood abuse; poor grades; and dropping out of school. The latter two factors may simply be a result of inhalant use, however, rather than its cause. Interference with role fulfillment. The person's use of inhalants frequently interferes with his or her ability to fulfill obligations at work, home, or school. People may find they are unable to do chores or pay attention in school because they are under the influence of inhalants. Personality changes. The person experiences significant behavioral or psychological changes during or shortly after use of an inhalant. These changes may include spoiling for a fight; assaultiveness; poor judgment; apathy ("don't care" attitude); or impaired functioning socially or at work or school. Inhalant-specific intoxication syndrome. Two or more of the following symptoms occur during or shortly after inhalant use or exposure: dizziness; involuntary side-to-side eye movements (nystagmus); loss of coordination; slurred speech; unsteady gait (difficulty walking); lethargy ( fatigue ); slowed reflexes; psychomotor retardation (moving slowly); tremor (shaking); generalized muscle weakness; blurred vision or double vision; stupor or coma; and euphoria (a giddy sensation of happiness or well-being). Inhalants are one of the few substances more commonly used by younger children rather than older ones. It has been estimated that 10%–20% of youths aged 12–17 have tried inhalants. About 6% of the United States population admits to having tried inhalants prior to fourth grade. The peak time for inhalant use appears to be between the seventh and ninth grades. Inhalants are sometimes referred to as "gateway" drugs, which means that they are one of the first drugs that people try before moving on to such other substances as alcohol, marijuana, and cocaine. Only a small proportion of those who have used inhalants would meet diagnostic criteria for dependence or abuse. Samples of some hazardous substances that might be abused as inhalants, including nail polish remover, aerosols, paint thinner, and glue. People rarely seek treatment on their own for inhalant dependence or abuse. In some cases, the child or adolescent is brought to a doctor by a parent or other relative who is concerned about personality changes, a chemical odor on the child's breath, or other signs of inhalant abuse. The parent may also have discovered empty containers of the inhaled substance in the child's room or elsewhere in the house. In other cases, the child or adolescent's use of inhalants is diagnosed during a medical interview, when he or she is brought to a hospital emergency room after overdosing on the inhalant or being injured in an accident related to inhalant use. Although inhalants can be detected in blood or urine samples, laboratory tests may not always confirm the diagnosis because the inhalants do not remain in the system very long. Other substance use disorders are commonly seen among people diagnosed with inhalant dependence. The use of inhalants is usually secondary to the use of other substances, however; only occasionally are inhalants a person's primary drug of choice. Intoxication from the use of such other substances as alcohol, sedatives, hypnotics (medications to induce sleep), and anxiolytics (tranquilizers) can resemble intoxication caused by inhalants. Furthermore, people under the influence of inhalants may experience hallucinations (typically auditory, visual, or tactile); other perceptual disturbances (such as illusions); or delusions (believing they can fly, for example). Chronic inhalant users are difficult to treat because they often have many serious personal and social problems. They also have difficulty staying away from inhalants; relapse rates are high. Treatment usually takes a long time and involves enlisting the support of the person's family; changing the friendship network if the individual uses with others; teaching coping skills; and increasing self-esteem. Inhalant intoxication is often treated in a hospital emergency room when the affected person begins to suffer serious psychological (such as hallucinations or delusions) or medical consequences (difficulty breathing, headache, nausea, vomiting) from inhalant use. The most serious medical risk from inhalant use is "sudden sniffing death." A person using inhalants, especially if they are using the substance repeatedly in a single, prolonged session, may start to have a rapid and irregular heartbeat or severe difficulty breathing, followed by heart failure and death. Sudden sniffing death can occur within minutes. In addition, inhalant use can cause permanent damage to the brain , lung, kidney, muscle, and heart. The vapors themselves cause damage, but there are also dangerously high levels of copper, zinc, and heavy metals in many inhalants. The course of inhalant abuse and dependence differs somewhat depending on the affected person's age. Younger children who are dependent on or abuse inhalants use them regularly, especially on weekends and after school. As children get older, they often stop using inhalants. They may stop substance use altogether or they may move on to other substances. Adults who abuse or are dependent on inhalants may use inhalants regularly for years. They may also frequently "binge" on inhalants (i.e., using them much more frequently for shorter periods of time). This pattern of use can go on for years. Parents can help prevent the misuse of inhalants by educating their children about the negative effects of inhalant use. Both teachers and parents can help prevent inhalant abuse and dependence by recognizing the signs of inhalant use, which include chemical odors on the child's breath or clothes; slurred speech; a drunken or disoriented appearance; nausea or lack of appetite; and inattentiveness and lack of coordination. National Clearinghouse for Alcohol and Drug Information. (800) 729-6686. <http://www.health.org> . National Institute of Mental Health. 6001 Executive Boulevard, Room 8184, MSC 9663, Bethesda, MD 20892-9663. (301) 443-4513. <http://www.nimh.nih.gov> . National Institute on Drug Abuse (NIDA). 5600 Fishers Lane, Room 10-05, Rockville, MD 20857. Nationwide Helpline: (800) 662-HELP. <http://www.nida.nih.gov> . thanks for putting this page on the internet it really helps my school project.